Headquartered in the heart of The French Market! Great live jazz education seminars and walking tours! A must see when in The French Quarter. Jazz is the lifeblood of New Orleans and the soul of The French Market. So you might say, “Isn’t The French Market all about shopping and eating?” To that I guess you’d be surprised to know that the New Orleans Jazz National Historical Park’s office and performance space is located right in the heart of The French Market. Right there in Dutch Alley and everyday people from all over the world are treated to free jazz music and tours about the historical role of Jazz and New Orleans or vice versa. 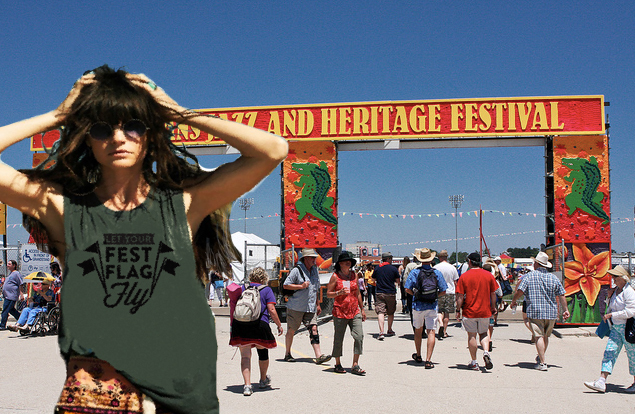 On a recent visit to The French Market I came dressed in my yoga attire and toted my yoga mat right to the Jazz Park’s performance space for the weekly Jazz Yoga at The French Market. With the chairs pushed to the side in the performance space, the group of about 15 people all came with the same mantra in mind . . . jazz up their restorative yoga practice with live jazz music. This easy intro class led by Susan Landry starts at 10AM and features Peter Nu on piano – definitely jazzed up my yoga routine! Plans are to continue to offer this complementary Saturday class through the end of the year and maybe beyond. Locals and visitors alike can try a little something new, and this class makes yoga available to anyone willing to join in. Can you really beat live Jazz music along with your yoga? When I tell you it was incredible – I really mean, well incredible and free to the public! 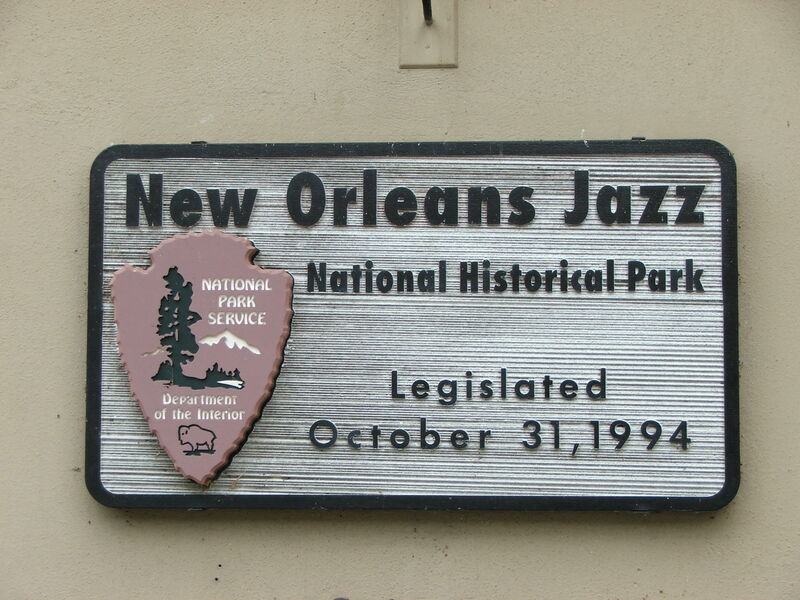 Afterwards, I lingered in the gift shop area and was thrilled with the offerings of jazz music and historical literature about Jazz and New Orleans. Park Rangers in uniform (think Smokey the Bear) are very informative and helpful. I picked up a schedule of the free, daily tours and concerts to pin up on my fridge. With so many out of town guests coming through I want to make sure to send them over to the Jazz Park headquarters to get a great start on their French Quarter experience. I did a double take when I saw a familiar face in a Park Ranger uniform – it was Bruce Barnes, known around the world as “Sunpie” Barnes, a famous New Orleans musician. Wow. Now that’s keeping it real! Afterwards, with Jazz Yoga under my belt and feeling grounded, I decided to hit the ground running with my new shopping mission/mantra, “How can I jazz up my life with goodies from The French Market?” It turned out to be a “big easy” task. Right next door to the Jazz Park is The Dutch Alley Artist Coop, home to more than 20 local artisans and their locally made wares. I was immediately greeted one of the friendly artist staff members Kimberly Parker. At this unique gallery the artists actually take turns manning the gallery and are especially informative and engaged. Just this alone makes visiting Dutch Alley Co-Op an extra special place to shop! When I told Kimberly my mission was jazz themed items, she showed me a gorgeous hand-made lapel pin by Stefano Velascka. Stefano’s hand crafted jewelry is cleaver and incredibly detailed. This Chech native has been a mainstay at the flea market area since well before Hurricane Katrina. You can find him actually working and creating pieces in his booth space at the Flea Market. At the Dutch Alley Artist Coop, his groupings represent the array of the skill he possesses and genre he explores. 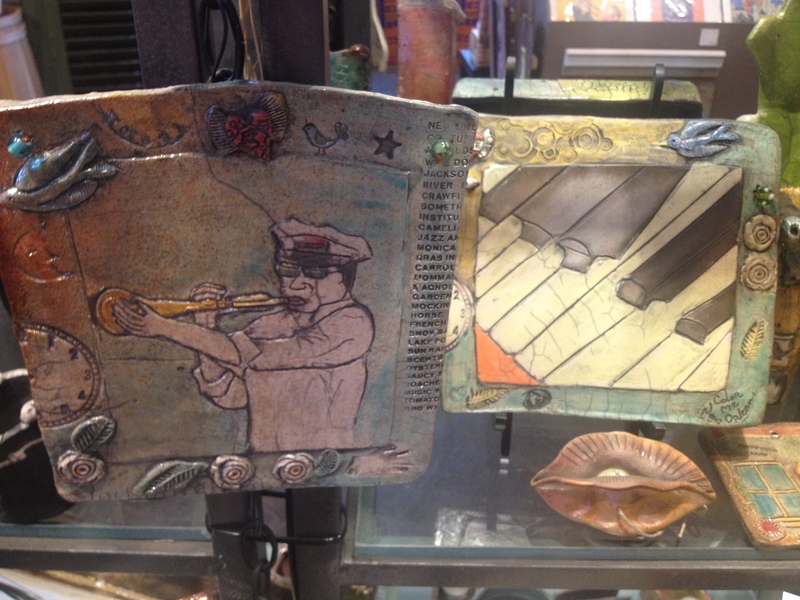 In particular he works with found metal and inspirations from the sights and sounds of his beloved New Orleans. 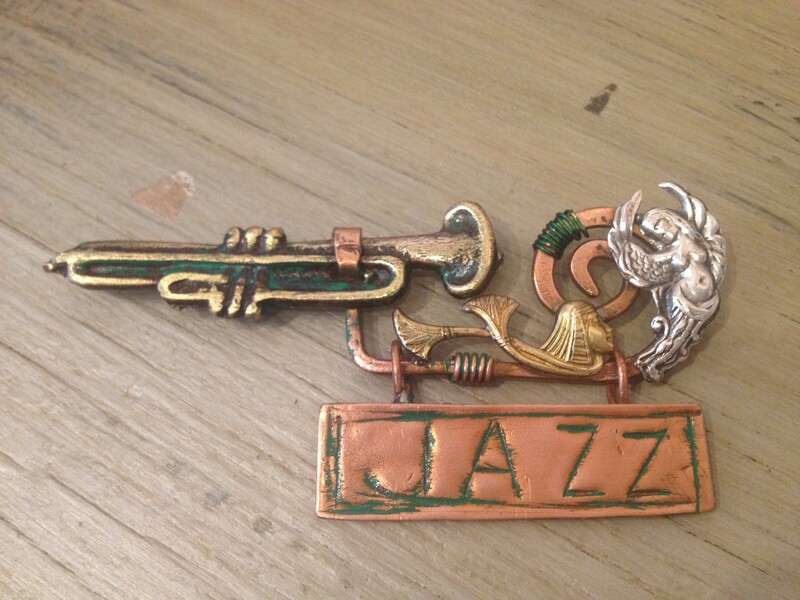 I loved the Jazz broach – featuring a trumpet and the word JAZZ inscribed on the piece. 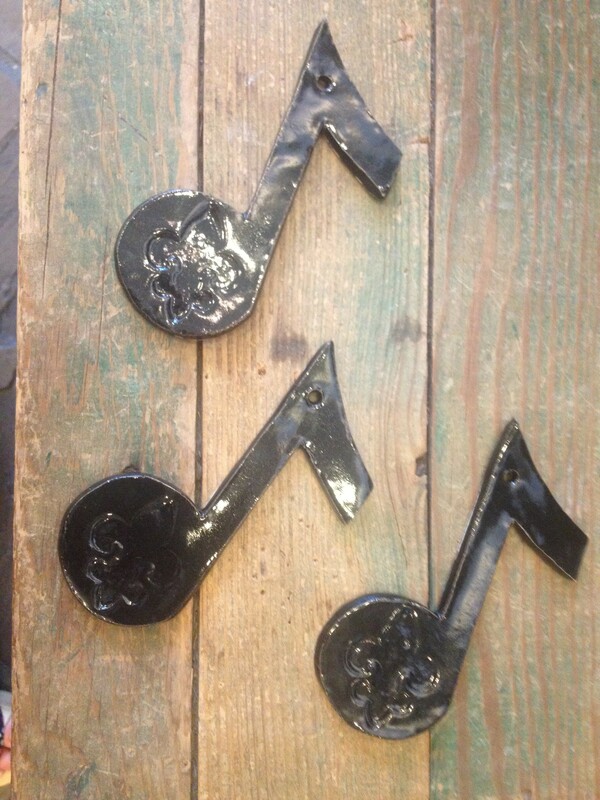 Gerald Haessig hand-made music notes at Dutch Alley Artis Co-op. Kimberly also introduced me to the work of Gerald Haessig. His ceramic pieces are both functional and decorative. Gerald’s hand made music notes were music to my decorative ears. These hand-cut and glazed notes will look perfect hung on my Christmas tree with red ribbon. Hmmm. A necklace perhaps? All three please! Hand sculpted RAKU potter pieces by Joy Gauss features carved and relief accents. And, I don’t even know where to begin to describe Joy Gauss’s RAKU pottery creations. Her sculpted and hand carved pieces and particularly her super jazzy, music inspired creations were not only charming but serious works of art. You can really tell that Joy puts her creative soul and heart in each of these pieces. I’ve long been a fan of her bone gang jars. But, am really in awe of these intricate pieces. Definitely check her out. 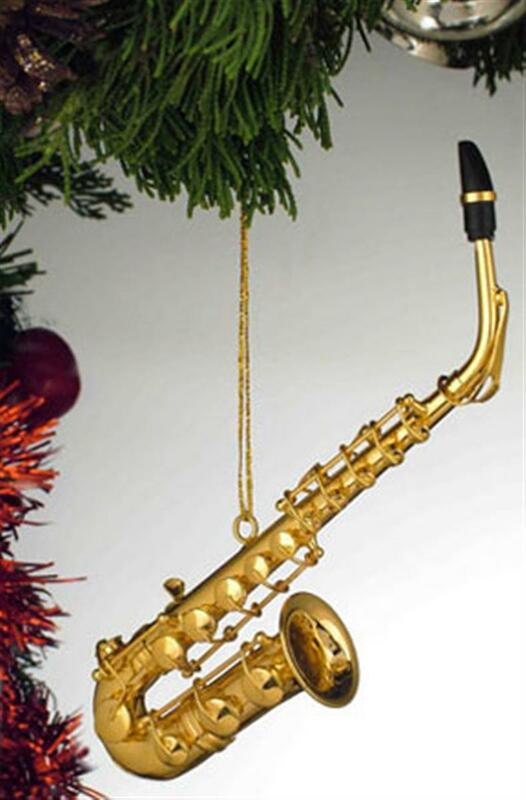 Cutest ever music themed ornaments and more . . there isn’t an instrument they don’t have at Merry Christmas and All That Jazz! Oh, my. Really? Christmas in July? How ‘bout Christmas all year ‘round at Christmas and All That Jazz? Maqbool Ibrahim, storekeeper extraordinaire has gone over-board (in a good way) with his ultimate collection of hundreds of holiday ornaments that line the walls and represent hundreds of genres. Truly if you can’t find an ornament representing whatever you fancy then it just doesn’t exist. My holiday spirit was captured by the extensive offerings of tiny music instruments. I admit it was hard to stay on my jazz mission when the cutest miniature carnival mask ornaments are close by and oh so tempting. Inside the shop is a huge listening station where the selection of New Orleans-centric music choices cover jazz and beyond. Jazz themed art and posters cover the walls floor to ceiling. And, there is even the cutest cookie jar shaped like a cool jazz musician rounding out their jazz focused offerings. 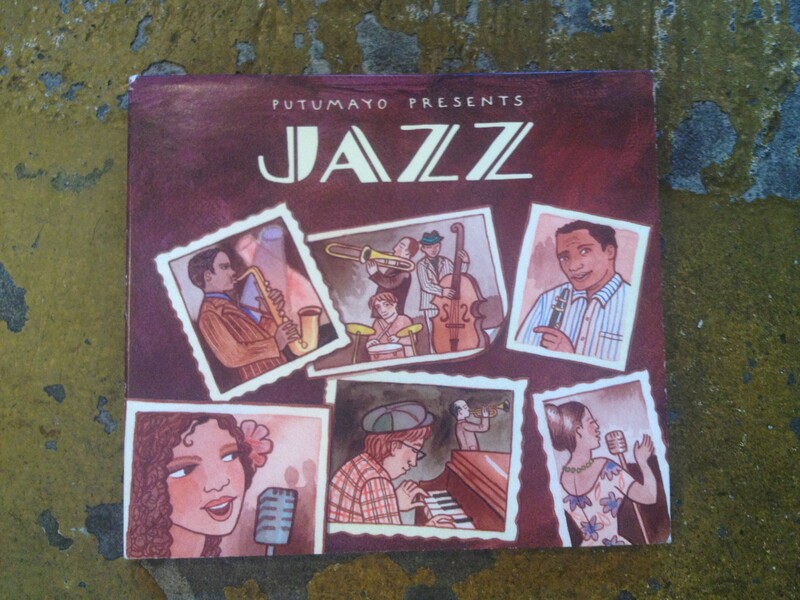 Putumayo World Music selections available in The French Market! While the gift shop at The Jazz Park visitor center has quite a few books and music cd’s focusing on jazz, I also stumbled into A Tisket, A Tasket and found not only the Putumayo World Music’s compilation of Jazz but also another title they created, World Yoga. It turns out that one of the most accomplished yoga instructors in the world, Sean Johnson of Wild Lotus Studios in New Orleans is also a world-famous Kirtin musician and travels extensively with his Wild Lotus Band. Apparently, Dan Storper the owner of Putumayo World Music and a full-time Marigny resident (the cool neighborhood just on the other side of The French Quarter) pulled this compilation together from the company’s extensive catalog of recordings. Dan and crew at Putumayo even tested the compilation with Sean and his team to ensure the cd played in full creates an entire restorative yoga session. So, not exactly jazz yoga but with this compilation you can jazz up your yoga practice wherever you are! Check out cut 11, Ramachandra, recorded by The Wild Lotus Band. 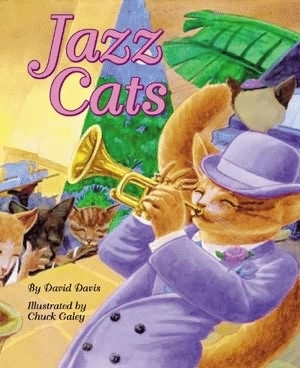 New Orlean’s published Jazz Cats for your little jazz master! Don’t forget to check out the book selections about jazz. Jazz Cats by David Davis and Illustrations by Chuck Galey is the cutest story about fun musician cats on the prowl in New Orleans. I love that Pelican Publishing locally publishes it. Jazz Cats is a great intro to jazz instruments and the sights and sounds of The French Quarter. 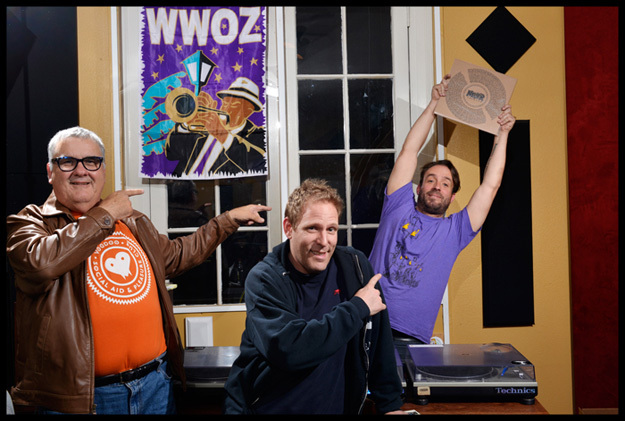 Every Wednesday night at 10PM “Double A” and AJ team up for WWOZ’s kitchen sink . . . tune in to 90.7FM or on the web and stay connected to New Orleans. Speaking of live music and The French Market – live Jazz music is a mainstay at The Market Cafe everyday. You can sit out all day and all evening and listen to some of the greatest New Orleans musicians interpret Jazz standards while you enjoy some delicious food. The owners have made a real commitment to creating a festive atmosphere and it truly makes for a special treat. Stylish fleur de lis yoga pants are sure to please from Pop City! Before I can cross the street and grab a seat next to the band, I’m lured inside Pop City when I notice the cutest pair of yoga pants embellished with the ubiquitous fleur de lis. Score! Actually, the girls have a whole section devoted to this casual style of pant. The ombre dyed yoga pants in orange, blue, red and mint are to dye for! They are so cute with a casual top and some stylish Reef Flip Flops (pst. Pop City is the only shop in The French Quarter authorized to sell Reef sandals!). They’ve really brought chic to casual style. Wait ‘til next Saturday! Jazz yoga here I come! Unique printed shirts with New Orleans themes available at Pop City. As I’m leaving i notice a poster for the Satchmo Festival and realize its that time of year nearing early August when the annual Louis Armstrong festival kicks off the beginning of August. 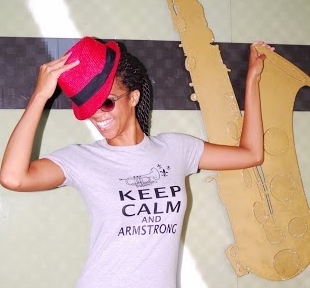 Speaking of Louis Armstrong . . .also at Pop City, I spy a neat shirt featuring a trumpet blowing fleur de lis and the directive, “Keep Calm and Armstrong.” I grab one in my size knowing that I can sport it at the Satchmo Summerfest happening at the US Mint on August 1-4, 2013. Although on the grounds of the US Mint, the fun and music happens right next door to The French Market outdoor flea market bringing a festive, party and jazzy atmosphere to the entire French Market scene. I’m ready to pay homage to the master. As I wind up my afternoon at The French Market, I’m overcome by the diversity that makes The Market so special. The shop owners, mostly locals, add to the power of the experience. Like Jazz musician Herbie Hancock said, “Jazz is about being in the moment.” And, I recommend taking time to make a moment at The French Market soon. Also, for all the details on Jazz Yoga visit www.thefrenchmarket.org for times and schedule. ← “Storming” The French Market To Celebrate Bastille Day Festivities, Great Shopping and Grande Fun!